A Jaguar XJ saloon has travelled the length of the UK on just one tank of fuel – and then went on to top 1,000 miles (1,609 kms) in total. 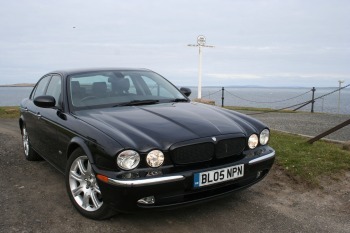 The luxury XJ TDVi completed the trip from John O'Groat’s to Land’s End – a distance of 840 miles (1,352 kms) – with average fuel consumption of 53.5 mpg* (5.28 litres/100 kms). Having reached Land’s End, the driver headed back to Jaguar's Midlands HQ without refuelling and reached a total of 1,000.2 miles (1,609.6 kms) before the tank ran dry. The outstanding achievement is testament to the XJ's inherent technological strengths, which include advanced aluminium body construction and a state-of-the-art, twin-turbocharged V6 diesel engine. The XJ TDVi was a standard specification model and was even complete with satellite-navigation, CD auto-changer, Premium Sound and rear DVD screens. The XJ TDVi Diesel boasts an average fuel consumption figure of 35mpg (8.1l/100km) combined cycle, 26.0mpg (10.8l/100km) Urban and 43.7mpg (6.5l/100km) Extra Urban and produces just 214g/km CO2, which is outstanding for a car offering the space, comfort and performance of the award-winning XJ. Geoff Cousins, UK MD, said: "We were always optimistic that the XJ Diesel could do this, but the figures we achieved were beyond our best expectations and show that the XJ 2.7 TDVi is a truly economical luxury car. Following the recent questions about the UK Government offering its ministers the choice of a Jaguar XJ Diesel, this proves how the XJ really is one of the most environmentally friendly cars in its class."